THE captain of Henley Rugby Club’s Bears side has died after collapsing during a match on Saturday. Father-of-two Simon Priestley, 46, was playing for the club’s fourth team against High Wycombe when tragedy struck. The match, on the pitches off Marlow Road, was abandoned as the club's physio, the referee, and several players from both teams, and as well as ambulance and air ambulance crews, tried in vain to save his life. He was pronounced dead at the hospital later and leaves his wife, Julie, and two children Amelia, 11 and Jonty, nine. 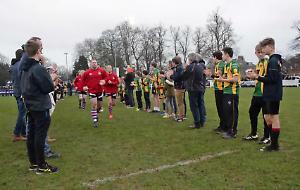 Players, supporters and his team mates linked arms and held a minute’s silence for Mr Priestley at the club yesterday (Sunday). A statement from the club said its thoughts were with his family. It said: “Simon joined the club from Coventry in 2001, and would almost certainly have been a regular player for the Hawks, but he sustained a very serious leg injury which stopped him playing for well over a year. “He then became a stalwart of the Henley Wanderers Club and was a key part of the success that they enjoyed for several seasons. He has continued to play regularly for both the Bears and the Vultures for which he was the lynchpin and ever present general in the back line. “He was also one of the coaching team with the Henley U10s for whom his son Jonty plays, and we know that everyone involved with the mini and junior section of the club will be feeling shocked and desperately sad at this time. “Simon was, above all else, a brilliant bloke. Steadfast, loyal and talented on the one hand, and his sharp wit and sense of fun and joie de vivre were always in evidence in the changing room, in the bar and especially on the many tours that he went on with the club - something at which he was brilliant at, and he led the last two Vultures trips to Jersey and Lyon – from the front. For the full story and tributes see this week’s Henley Standard.